This little envelope purse has redeemed me from my inner critic calling me a "bad mom". On our recent trip to NYC, my 4 year old had a bad fall on the cement at a playground. We were a couple of blocks from our friends' apartment, where I had all of my supplies (first aid stuff). For what felt like an eternity, but was probably only a few seconds, I held her crying with her scraped elbow... pondering my options and kicking myself for not being more prepared. With my first child, I never left the house unless I packed every possible bit of gear we might need on our sojourn to the grocery store. As I saw my mothering history pass before my eyes, my former self ( young mom), came running over with wipes, Neosporin spray, band aids... you name it! I was forever grateful and swore to never leave home without a first aid kit again. To cut myself some slack... we do live in the country, and when we go to playgrounds, we drive. My vehicle is fully stocked... and now my purse is, too. Traditional first aid kits contain mostly items we never use. 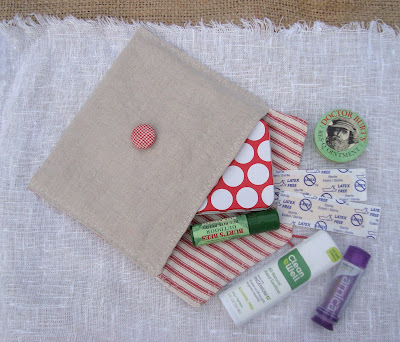 This one is filled with our natural remedies and latex-free band-aids. Both my daughter and I are allergic to latex, so this is key. The envelope purse is made out of linen and lined with thrifted ticking (an ode to candystripers) and closes with a red-checked linen button (echoes of the first aid "cross"). It was super quick to make and I really love it. So much so, that I'm planning on making some more and writing up a tutorial as I go along. I realized it was the perfect bag for a new sewer. I've heard there are quite a few of you that would enjoy some more simple sewing projects. Look for this soon! I'm a nurse who is fairly new to sewing- this is practical & adorable. Such a great idea - I look forward to the tutorial. It's lovely. I really like the fabric you chose. Now me - I'm as unprepared as they come. When my son cut his chin in Portland we had to go to Seven Eleven for ice and rags then shleped to the hospital. Fortunately it was only four blocks away. For years I've toyed with putting a litte black bag in my car full of medical supplies. Your bag is much prettier. love it - adorable and useful - looking forward to the tutorial! I am glad that there was someone there to help you when she fell. We had a nasty fall recently and not one Mum in the reasonably busy playground came to help or see if my little girl was okay. It was so miserable. Looking forward to the tutorial as I am one of those beginning sewers! This is great and reminds me I need to be better on this front. I don't carry anything with me, not in the car, only at home in the bathroom closet! So far we've been lucky that Eleanor (2.5) has only had literally one scrap that has needed some care and we were at home - she's more of a bruiser it seems. Thanks, Maya! i, too, carry a bag of all of our cold prevention homeopathics and first aid goodies when we travel. i have learned the hard way not to leave home without it. i would add all terrain's bite soother to your list-anything allergy oriented or scrapey bitey-this puts am immediate stop to the pain. i would totally buy or make your stylish bag and lay to rest the sticky gallon ziploc my stash sits in now, awaiting our next outing! hi, i love your first aid envelope. As i am an absolute sewing beginner, i hope you will write a turotial so i can sew one for me and my little son. This is a great idea. I'd love a tutorial! the perfect practical project maya. You are brilliant! Great idea! I really need to do the same. I have a medicine pack with stuff needed for my child's food allergy but no first aid. And your kit contents look exactly like that I use!!! Don't you love the Clean Well spray? I'm so glad you posted this! Just yesterday I was searching all over etsy to find a good First Aid Kit idea. Yours tops them all. Very nice! I love this idea...my little boy had a fall on our morning walk this morning and I ended up carrying him in my arms to the nearest pharmacy. I definitely need to make one of these! 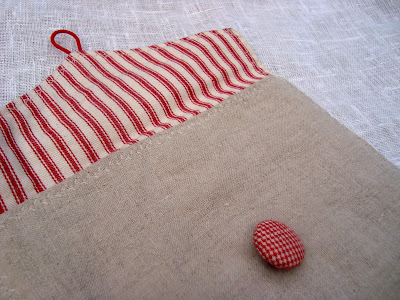 I love the combination of the natural linen with the red ticking and checked button! maya, that is a great idea. Thanks for sharing and inspiring the rest of us! I just made some little purses to carry your hygienic towels, and they were a big success too! Ooooh! I'm a new sewer - can't wait for the tutorial! And while I don't have any kids of my own - what a neat gift to throw in with a baby shower or kid birthday gift to help out mom? Perfect! Ah, the differences when it's not your first time! I'm on baby #4... I pretty much figure someone else will have that stuff, so why carry it? I know, right? My younger self would be horrified. How awesome is that! I would love the tutorial. I would be so grateful it if you featured some novice sewer tutorials. I'm determined to learn to sew this fall, but am finding that a) it's very, very difficult to find places that offer lessons (at least in my New England college town); and b) what lessons there are tend to presume a fair amount of sewing experience. One sewing machine business in a city near my home offers "open sew" sessions where one can bring a work-in-progress and ask the teacher for guidance in completing it. So I plan to attend a few of those... but must first, of course, choose a suitable W.I.P.! I wonder if, in addition to a few simple patterns, you might also offer your thoughts on how best to choose and buy a sewing machine? Since I know you made your own wedding dress, I gather that you've been sewing for your whole life. But I'm sure that many of your readers would gobble up any reflections on what tools and projects were useful for your own learning curve... or even on how you might be introducing your children to sewing. Okay. Those are my two cents. But please know how wonderful and useful your site is already! It's really a daily treat to visit your projects and your world. My mother recently hosted a travel-themed wedding shower, and she made hundreds of those woven map hearts that we had seen and admired here. So, thank you very, very much, Maya! Aw! I wish I could find a sewing machine so that I could make one of these for everyone I know! They are so sweet and practical! Thank You for sharing such wonderful ideas! Maya, I love it. So whimsical and fun. What a great idea. I believe that I need one of these with my two boys in tow. Have a great day. I so need to do that! Ever since I stopped carrying around an "official" diaper bag, I haven't had a first aid kit. I never think about it until I need one! 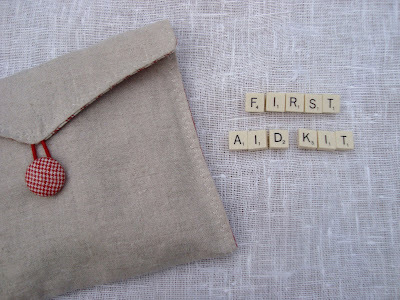 a first aid kit has been on my to-sew list for ages now. never came around. thanks for the reminder. Great idea and super cute. I love all the burts bee's supplies! I love this!! What a great idea- cute and practical! A stocked kit would be a lovely gift. I've been thinking about first aid kits lately. We don't even have one in the house! Such a great little bag! This is just the kind of project I've been looking for. I've just started sewing and still have a lot to learn, but am excited to try my hand at simple, gorgeous projects like this. I'm looking forward to the tutorial! Yes, definitely a tutorial! Would love to make one of these but am still at the stage in sewing where I need step by step by step instructions, things are intuitive yet. Great little addition to the travel bag!! What a super cute bag and a FANTASTIC idea! I am notorious for being unprepared and this is such a cute, practical idea. Hopefully I can implement it and actually follow through! ha ha ha! im learnign more and more i need to start carrying a bag/purse with me and this is deffinatley something ive got to make to go in it! Maya this is such a good, sensible idea, and done in your usual, lovely way. I'm going to remember this, its something. oh what a great idea1 i look forward to the tute for this bag! Ha - you must have been hovering near me the other day when I was bringing a herd of children back from kindergarten - my son fell over and landed on some glass - he managed to scrape both knees, most of one elbow and got glass chunks in his hand. Fortunately I had an antiseptic wipe and a band-aid in the pouch of my daughter's pushchair so I could fix him up, because of course that was the day I had no handbag full of supplies. My resolution that day was to make a little pouch to contain just this kind of thing - mind has a red cross on it! Thanks for sharing your great idea. The bag & the idea are great. Thanks to my mom's training, I keep a few of those things on hand & I don't have kids. After all, even adults fall down, right? I look forward to making one of those bags, maybe a little larger to include some 'adult' emergency supplies. And btw, for a car 1st aid kit, there's little that will beat a lunchbox picked up at the thrift shop. Thank you for your post about assembling a first aid kit. I've followed your cue and made one for us to use on our travels. Today I posted about it and included links to your blog about both the kit as well as the tutorial on making the bag (I just used a bag I'd already made, but really like your project, too).